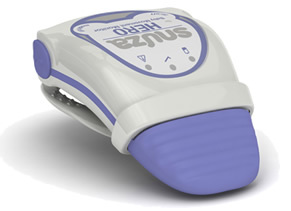 One of my best purchases while I was pregnant was the Snuza Hero. What is that you may ask? Well, in a nutshell it is a movement monitor, but it clips onto their diaper vs. being under a mattress like some of the other options. It’s portable. How it works: No movements sensed in 15 seconds, it vibrates to try and arouse the baby. If another so many seconds passes without movement detected, a really annoying/loud alarm goes off. I know this sound because we have gotten a few false alarms which are typically caused if it falls off her diaper or she is laying on her side (which she loves to do). It went off like the 5th night we had Berkley home and Adam and I were like bats out of hell until we got to her. Why I love it: Well, its portable and it’s small. I take it with us when we travel. It doesn’t matter if she is in her crib, pack n play or bassinet. It’s on her. I actually can’t sleep at night unless I know its on her. If you are a worrier like me & stress about things like SIDS… this product is for you. 4 months and loving life! 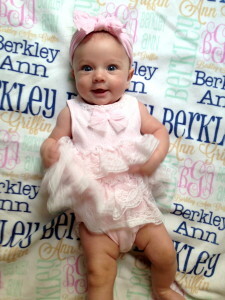 Berkley is just over 4 months old! We are having so much fun with her. Give me a 4 month old any day- this is definitely my favorite age so far. 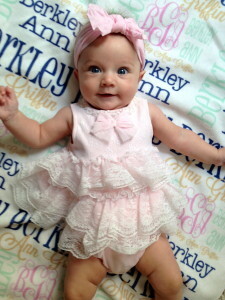 Berkley loves to smile, gasp, be outside and put everything in her mouth. At her 4 month appointment she was the 29th percentile for weight (whoop!) and 70th for height. I am trying to soak it all in – thank you Lord for this precious baby girl.